Defrost the spinach in a colander. Squeeze most of the water out of the spinach with a couple paper towels. Cook the shallots and 1 tbsp butter in a large pan over medium heat for 1 minute. Add the spinach and salt and cook for 3-4 minutes. Remove the pan from the heat. Butter a 6 cup souffle dish (you’ll see we just used a square pyrex) and sprinkle it with 1/4 cup of the grated cheese. Set it off to the side. In a saucepan, melt 2 1/2 tbsp butter. Stir in the flour and cook for about 2 minutes. Remove from heat and pour in milk. Beat with whisk until blended. Return to heat and stir with the whisk until the mixture is bubbling. When it thickens, whisk in the egg yolks one at a time. 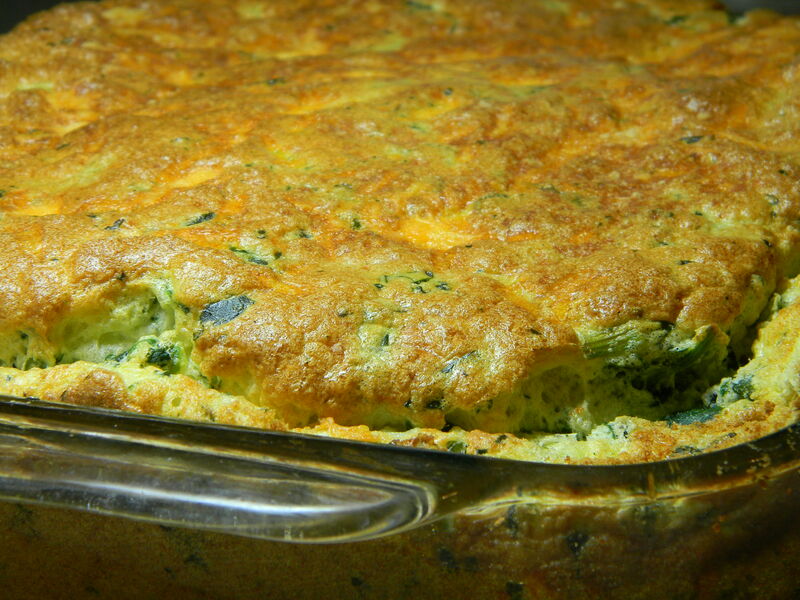 Add the egg/ flour base to the spinach off to the side and then add 1/4 cup more of the cheese. Get our your mixer and wire whip attachment to whisk your egg whites. Put the egg whites in a large bowl with a dash of salt and beat on high until you have white stiff foam. Now comes the tricky part – folding in the egg/flour/spinach business to the egg whites. Add the egg/flour/spinach to the egg whites and, using a spatula, pull the egg whites over the thicker mixture from the bottom up. Essentially, you’re continually folding one over the other. Try and keep as many of the egg-white-bubbles in tact as you can. Finally, pour the fully folded mixture into the prepared souffle dish (or pyrex, or whatever you had on hand). Sprinkle with the remaining cheese. Put it in the oven, turn the heat down to 375 and bake for 23-25 minutes. Watch it around the 22 minute mark and take it out when it has risen and is sufficiently golden-brown on the top. Serve immediately and enjoy! Thanks to ‘From Chapel Hill to Chickenville’ for initially adapting this recipe from Julia Child’s Mastering the Art of French Cooking to a blog format. You can find their interpretation of the recipe here.